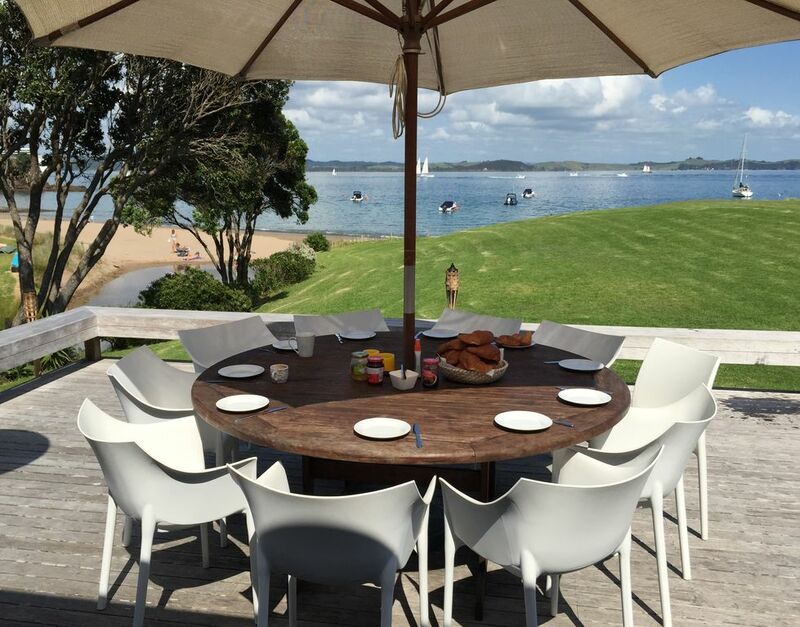 Absolute beach front luxury beach house at the gateway to New Zealand’s famous Bay of Islands. Four bedrooms and two bathrooms sleep 2-13 guests. Panoramic beach and bay views with an endless procession of passing boats and romantic sunsets. Private access to a safe all tide swimming beach with no road or dunes to cross. Five Kayaks and row boat or swim to the diving pontoon in front. Rinse off under the hot outdoor shower when you return. Located on Tapeka Point beach - just two minutes from historic Russell village with island boat tours, ferries, attractions, shops, vineyards, bars, restaurants and nearby world class golf courses. Air conditioned for year round comfort or open up in the summer months and have the ceiling fans create a tropical breeze.. The outdoor living and entertaining area is superb with a large furnished deck with loungers and BBQ grill. A covered verandah surrounds the house with direct access from bedrooms and living area – all just a few steps from the beach. All linen, towels and beach towels are supplied ready to walk in and enjoy. The Master bedroom is on a secluded wing with a new king bed, heated ensuite bathroom, TV and sea views. Bedroom 2 - queen and single with sea views. Bedroom 3 - king and king single bed. Bedroom 4 - massive bedroom / family / teen escape / second living room. This contains a king bed, king single and two standard singles that can be placed together to create another double. Air conditioned with sofas, sound system, TV, DVD and fridge. Portable cots, high chair and bath are available for infants. The inside living area has high ceilings, comfy leather sofas and a nautical theme with a Cape Cod feel. Panoramic sea and beach views extend through floor level sliding glass doors that open the room onto the deck. Lots of books, magazines, games and DVD’s. Fully equipped granite kitchen includes an ice maker, dish drawer dishwashers and Nespresso machine. Laundry with washer and dryer. Entertainment includes an Onkyo/Bose home theatre, TV, Sky, DVD, AppleTV and outdoor deck speakers with BT streaming. Telephone and free WiFi. The extensive grounds in front have ample off street parking. Boat ramp, ski lane and deep water mooring. Filleting station for the days catch, overflow / beer fridge and bait freezer. Tapeka is the closest launching point to the Bay and renowned fishing location. Indoors has comfy leather sofas. The wide glass doors open onto the deck with has table and surround seating. Open plan dining and living area with TV, home theatre, book case etc.